“HORSELEY FIELDS ” – a bagful of Nostalgia. 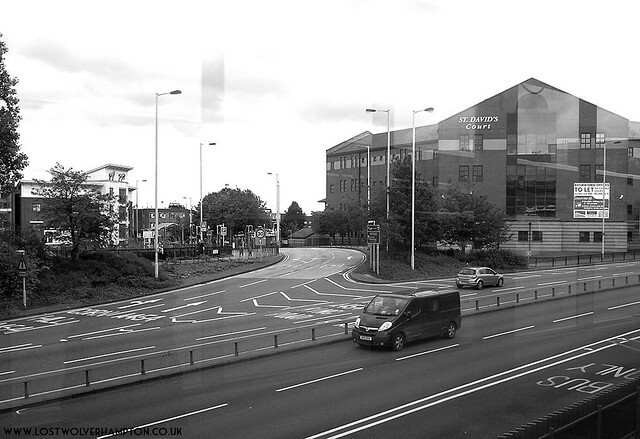 The view across the Ring-Road looking down Horseley fields from the Bus Station 2014. Today as I wait for my bus at Pipers Row, Bus Station, I gaze through the glass windows across the ring-road at St Davids Court and the “Novotel”, and my thoughts instantly return to a time when life around there was so different. My mind conjures up lost images of St James’s Square, Walsall Street schools and the Cattle markets, at a time when Horsely Fields was, as many people would agree, a separate town. Only the street names remain today, in 2014, to offer us links with a past, that has almost disappeared , but I have a bagful of nostalgia, collected from the older generation , who lived in this canal side community all those years ago, so lets take a look inside and hopefully cherish a little bit of The History and Mystery that was once Horseley Fields. Victoria Square , Corn Hill and Union Street between the wars. I have remarked many times the best way to get a clear picture of how life used to be, is to listen to the stories told by those who remember it for themselves. An example of such a story comes from Mrs Betty Farrell, born in Wolverhampton, Betty’s great grandfather, John Brier and his wife Sara, were the licensees of “The Vine Inn”, 85 Walsall Street in 1868, the Vine Inn was on the corner of Minerva Lane. She gave me this copy of a letter written by their thirteen year old son Charles to his parents dated December 6th 1875. In Harrods 1870 Directory, Alexander Hunter is listed as running, “The Commercial and Classical” day school, St James Square, and it is to this academy that Charles Brier attends. I am desired to inform you that our “Christmas Holidays” will commence on Monday the 20th inst, and that we shall be expected to resume our school duties on Wednesday January the 19th. It will I am sure give you great pleasure to learn that my conduct. diligence and attention during the past half year, have been thoroughly satisfactory to my masters and the progress I have made in my various studies, has been as rapid as they could have expected. The prizes will as usual be distributed on the day we break up, and I hope I may be fortunate enough to secure one. Please accept my warmest thanks, for all the kind care, and love you have ever bestowed on me . PS. Mr Hunter desires me to present his compliments, and to say, that he particularly requests, that you will kindly allow me, to return to school, punctually on the day it re-opens. Pictured on the left is the rear of Walsall Street Schools now being used as an annexe of the Technical High School.and Teachers College. In the background is what remains of St James’s Square. Now the name Union Street may not mean anything to townsfolk now. 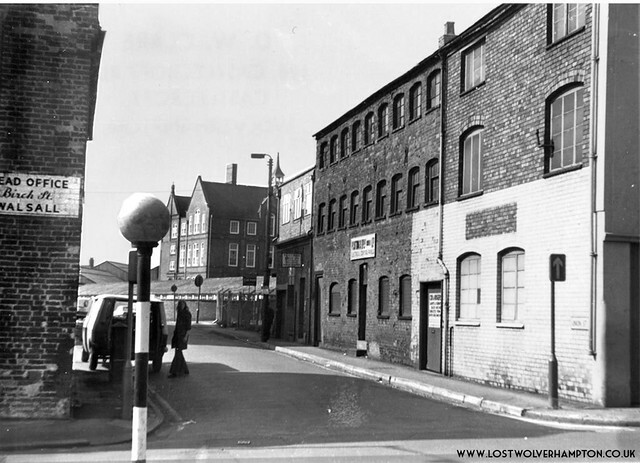 But to me in my youth, Union Street, was part of my daily walk to St Josephs School , through St James’s Square and Walsall Street , across Bilston Street into Steelhouse lane. But during Victorian times, we see by the following amusing article from the local press. It appeared then, ” Union Street “had somewhat of a chequered past. The fun was fast and furious at the Police Court last Tuesday, when Mr Yates applied for a renewal of the license of the “Talbot Inn”, Union Street ,which was took away some weeks back. The Counsellor and Lawyers had a good innings, and Mr Yates threw in the comedy parts enacting Simple Simon with the appearance of truthfulness. His evidence and cross – examination was real good business, uproarious fun was created by the Major part of his replies, to the questions of Minor details. Being so nicely packed with references to the Chief Constable who, bye- the- bye enjoyed the jokes immensely. Then followed the goody goody burlesque in which Mr Yates, declared, that he knew nothing of the character of the damsels in and around Union Street, and that he had never heard their praises sung in the local police records. This was most taking and amusing,. Then followed the two Thorne’s, and the rosy answers they got were sharp pointed specimens of the I- don’t – know -what – to-call-it – business. Did he get the license ? Oh no Certainly not – Certainly not! The Licensee of “The Talbot”, at that time, Mr Yates. In the earlier part of this decade the sight of returning Willenhall and Walsall Trolley buses turning left out of Horseley Fields into Union Street, then right heading to their terminus in St James’s square would have been a common occurrence. J.B. Jones Wallpaper merchants and is directly opposite Corn Hill and the Postman’s Delivery Office . Finally in the back ground are the old Walsall Street Schools previously mentioned. 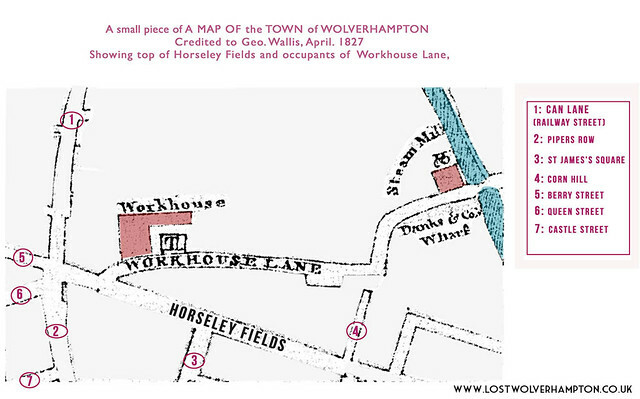 Workhouse Lane and Horseley Fields 1827. 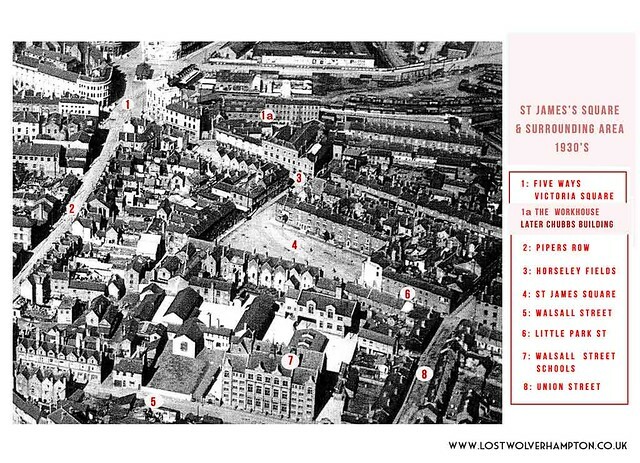 Some fifty Years before St James Square was built, Wolverhampton’s Workhouse was erected at the top of Horseley Fields, and until the Old Steam Mill at the junction with the Canal was rebuilt after the fire in 1842, and a connection was made to Corn Hill, Old Mill Lane was known as Workhouse Lane. It was originally built with the intention of offering some outdoor relief and medical services for the poor of the town. But in 1834 the government of the day, decided, that cossetting of paupers must cease; and in future they would live in the workhouse. This would be run by a union of parishes, and controlled, by a board of guardians who would ensure that conditions there, were rather worse, than the lowest conditions outside. and in 1837 a new workhouse was erected on the Bilston Road. The mice never got fat at the workhouse, when John Barker was Chairman of the Board of Governors ,the austerity of the provisions supplied, were matched only the by the grim workhouse building. His idea for the menu on Christmas Day, 1837, was breakfast , a half – pint of gruel with 2 slices of bread, Christmas dinner was 2ozs of meat and 2 potatoes, and they all went to bed after a supper, having had 2 more slices of bread and some broth. 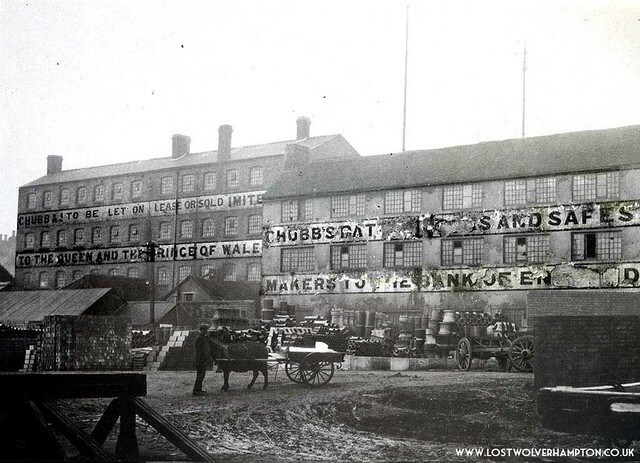 Old Workhouse seen from Railway sidings off Railway Drive, in 1913. The above picture is of the “Old” Workhouse, seen from the Railway Yard. This is a rare view and a favourite of mine. Parts of this building date from quite early in the 18th century, and after the departure of the poor,to purpose built premises on Bilston Road it was taken over as temporary barracks by the Wolverhampton Troop of Yeomanry Cavalry , later it became the works of Chubb’s Lock Manufacturers. The property as you can see was advertised in no uncertain manner. At the demise of Old Mill Street. 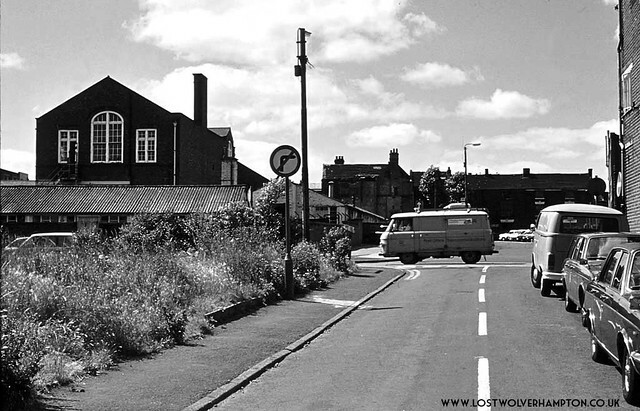 in the1970’s, The New Inn Hotel still stands on the corner with Horseley Fields. Finally, there was certainly a time in the past when thirsty callers at “New Inn” Horseley Fields, would have had the company of residents from the workhouse close by, in what became (Mill Lane). Because there was an older “New Inn” on this site in 1818, when the Licensee was a John Bate. (The New Inn Hotel – listed in Trades in Wolverhampton 1818). Oh that photo of Union st! I left school in 1958 and went to work for CA & WJ Postings in Union st almost opposite my grans shop in Horseley Fields. 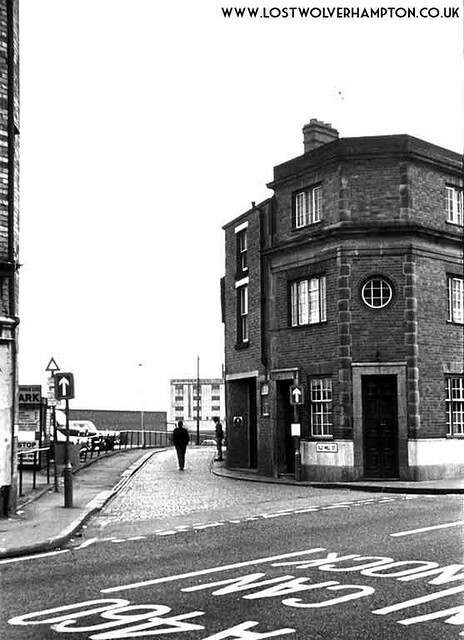 If i remember correctly,there was an air raid shelter on the left of the photo of old mill st,where the car park sign is. In the centre of the photo in front of the long wall was a row of houses where a mate lived. His name was Michael Green. There certainly was an air-raid shelter on the car park next to the New Inn. I lived directly across the road at 165 Horseley Fields, our shops were the small cafe and the second-hand and fishing tackle shop directly next to the garage (Mr Hopcutt). I used to watch the people come out of the pub and sometimes there would be fights and shouting and the men would play ‘pitch and toss’ with coins. We lived at 165 until about 1956 although we kept the one shop going for a few more years…..
Just a correction to my surname and e-mail address. I did not check it before i pressed the keys. Shame our Horseley Fields has disappeared through progress. The names and dates would be nice Christine, I have a William Picken in 1956, and Joseph William Bott in the early 1920’s.